This page is providing the brilliant career opportunity from GCWU Jobs 2018 | Govt College Women University Sialkot Jobs 2018 Online Form Download. 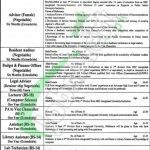 For all the job seekers of Sialkot who are looking for the jobs in GCWU 2018 are suggested to have a look because Govt College Women University Sialkot has announced the vacancies for which it is seeking to appoint the well disciplined, caliber and adroit applicants are required to apply for the following posts which include (Advisor (Female), Resident Auditor, Budget & Finance Officer, Legal Advisor, Lecturer (Computer Science), PA to Vice Chancellor, Assistant, Library Assistant, Lab Technician) are the current vacancies which need to be filled by the applicants along with overall qualification of MA/MSc/MBA/LLB/M. Phil/Bachelors from HEC recognized university is required to apply for such posts and relevant skills are required to apply for such posts. Now, I will let you know about its further details below. GCWU is abbreviated as Government College Women University Sialkot is the Govt Institute which is providing the best education to the students in number of the disciplines and bear the best faculty. Being a Govt College it offers Govt jobs of different educational levels for male and female both. Application form can be downloaded from the official site of this university www.gcwus.edu.pk. Applicants have to the pay the Bank Draft/Pay Order of Rs. 1000 for all positions in favor of Treasurer of the university. Application form along with copies of educational and experience certificates, CNIC, Domicile and 3 recent passport size photographs and bank draft should reach at the said address. The last date for applying is August 10, 2018. Last Date To Apply: August 10, 2018. Address: Registrar, GC Women University, Sialkot, Katchery Road Sialkot.